Sonia BasSheva Mañjon, vice president for diversity and strategic partnerships, is a distinguished presenter at a cultural identity conference Oct. 23. Sonia BasSheva Mañjon, vice president for diversity and strategic partnerships, will investigate two partnerships between higher education institutions and urban communities during a conference at Trinity College Oct. 23. The day-long event, titled “Cultural Identity through the Arts in Urban Communities,” will pursue how academic institutions can develop new and innovative collaborative projects with diverse communities in urban settings. BasSheva Mañjon, who is one of 15 distinguished presenters, will discuss the Green Street Arts Center and the 100 Families Oakland: Art & Social Change program. She will use multimedia presentations to display the impact and results of these campus community collaborations. “These organizations use art as a catalyst the core for social justice, transformation and civic engagement,” BasSheva Mañjon explains. “Transforming lives through the arts” is the tag line The Green Street Arts Center, which is supported by partnership between Wesleyan, the City of Middletown and the North End Action Team. The facility serves as a vibrant center for art and education, combining the resources of the university and a committed coalition of local residents to use art as a way to improve quality of life in an economically depressed community. 100 Families is a partnership between four communities in Oakland, California and the Center for Art & Public Life at California College of the Arts (CCA). The educational, grass-roots, civic engagement program that brings together families, artists, students, and educators in a multi-dimensional, interdisciplinary, art program that enlivens the creative spirit and celebrates the power of families and neighborhoods in Oakland, through the transformative process of creating art. At Wesleyan, BasSheva Mañjon provides leadership on civic engagement and cooperation with private and public organizations. Her charge is to enhance the university’s outreach and engagement with the greater Middletown community and local and state government. 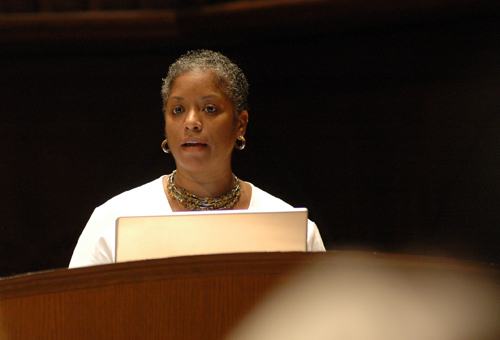 Prior to Wesleyan, she worked as the executive director of the Center for Art and Public Life and and held the endowed position of Simpson Professor of Community Arts at the CCA. She has more than 20 years of experience in higher education and nonprofit administration including executive director of the City of Oakland’s Craft and Cultural Arts Department, director of Community Arts and Education for the San Francisco Art Commission, executive director of the San Francisco National Academy of Recording Arts and Sciences and chief executive officer of Mañjon International Services. The conference will be held from 8:30 a.m. to 4 p.m. in the Washington Room in Mather Hall at Trinity College. The event is free and open to the public. For more information, contact the conference organizer, Eric Galm, at Eric.Galm@trincoll.edu or at 860-297-4201.